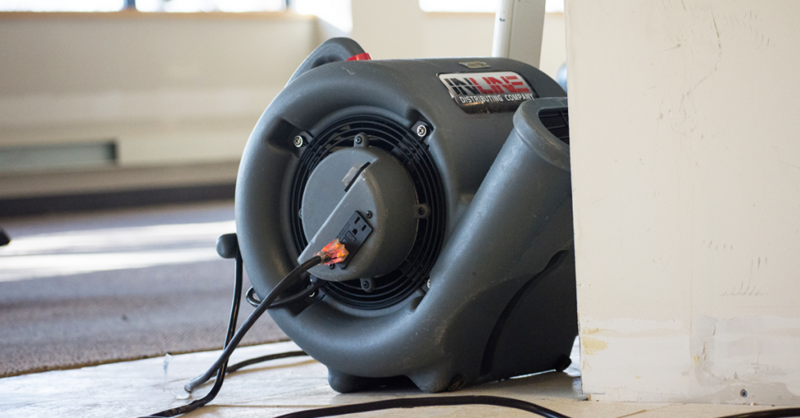 Removing water in its liquid state is at least 500 times more efficient than skipping this step and going straight into using air movers and dehumidifiers. After removing as much water as possible while in its liquid state, the remaining moisture is evaporated with high velocity air movers. As moisture is dried out, it doesn’t simply disappear; it evaporates and becomes water vapor in the air. Without dehumidifiers to remove this moisture from the air, other absorbent materials in the room could soak up the moisture and become damaged. This could delay the drying process and cause mold growth. Warm air between 70 and 90 degrees Fahrenheit is ideal, especially for the first 36 to 48 hours of drying. Cooler air slows evaporation, impeding the drying process. Overly hot air above 90 degrees Fahrenheit also impedes the dehumidifiers’ effectiveness.